The movie was great, don't get me wrong. I was one satisfied fan. However, nobody's perfect; hence, this four-star rating. It's time for some finger-pointing, and the fault may not be Michael Bay's. The whole Transformers series was about the robots, not the humans. The robots. Character development should be concentrated on the robots. But in the movie, only Optimus Prime was clearly characterized. Again, the robots are the main characters of the story, not the humans. Their war, our world. Their movie too. I can forgive Bumblebee being a Camaro, but I cannot forgive it when Bumblebee becomes reduced to a silent extra. And that is what cost this movie its one star. 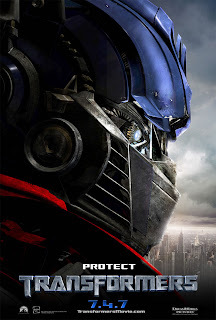 You may also want to check out the review of Transformers: Revenge of the Fallen. Or you could read the reviews of Transformers: Dark of the Moon here and here. Or you could read the review of the 1986 animated film.